My son Scott found the Red Jeep on Craig’s List. His original intention was to buy it for parts as the engine bay wiring harness was melted and he bought it for near scrap value. 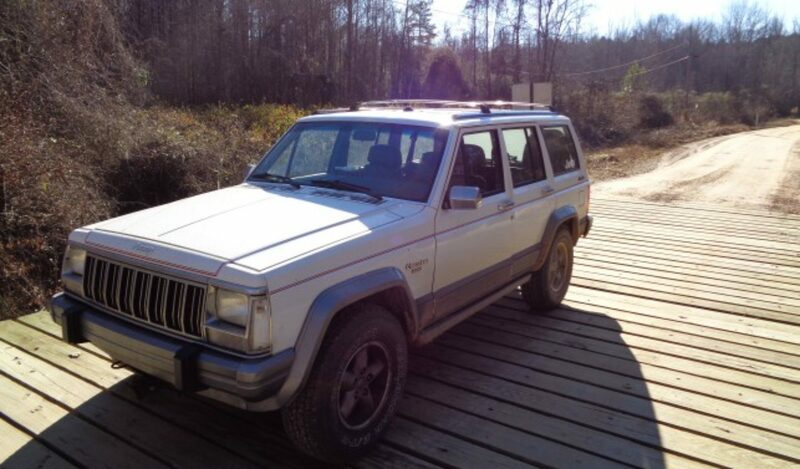 The owner gave us a very small time window to complete the deal and pick up the non running Jeep. We arrived in the dark and began pushing the Jeep into position to load it on the trailer. In the dark, Scott hooked the tow strap to the axle in a way that put pressure on the tie rod causing it to bend just as the front wheels got on the trailer bed. I was using a come-a-long to winch the Jeep onto the trailer and it became very hard to pull after the tie rod bent. I did not have the correct tools to pull the tie rod so I attempted to use a ratchet strap to straighten it. About this time the owner showed up with the paper work and wanting his money. He seemed to think we were complete idiots for having so much trouble loading the Jeep. He also just walked away without a word when I asked to borrow a wrench from him. By the time we had the Jeep loaded, there was quite a crowd gathered at the closed shop where the Jeep was stored. We were very glad to be loaded and out of there as we were getting a bad vibe about the whole situation. But we left with the Jeep and the title so we were good. When we got the Jeep back to the shop and looked it over, we found it was in excellent condition except for faded paint and of course the missing engine bay wiring harness. Scott decided to try to make it run again instead of just parting it out as originally intended. I assured him it would never run again, but he was determined. Scott and Megan began searching pull -a- part yards for a wiring harness. The 89 is a strange year for wiring harnesses. It appears that on some Jeeps, and this being one of them, that a wire was omitted from the computer harness and had to be added at a later step in the assembly. Since the computer is under the dash in 89 a hole had to be drilled to accommodate the extra wire. This hole was drilled rather crudely on this example. Scott eventually found a harness that did not have the extra wire and got the whole harness and computer just in case. After several hours of sorting out the various plugs, he finally got it all connected. Much to my surprise the Jeep fired right up. However it did have a stumble or a miss. We double checked the injector wiring and spark plugs but could not find the source of the miss. However everything else worked great. A few weeks later, I removed the bent tie rod and straightened it using my pipe bender. It actually turned out to be pretty straight. Scott got busy with other projects and let the Jeep sit over the winter. He eventually found a potential buyer for the Jeep as it sat. He fired it up and started to drive it back to his home but he did not make it very far. Over the winter, we both forgot that the front end alignment needed to be set after repairing the tie rod and the Jeep was just not running right with the miss. I took it back to the shop. A few days later, when I got ready to set the front end, it would not start. It seemed the NSS was stopping the starter from engaging. I had a spare transmission in the shop so I pulled the NSS and plugged it into the harness and it still would not start. I even put a jumper across the wires to the NSS and it still would not start. A few days later, I studied the wiring diagrams and then tracked down the wires to the starter relay. I found that by jumping the wire that goes to the NSS to ground, the Jeep would start. I also found that there was no continuity in the wire from the relay to the NSS connector. So, for now, there is a jumper in place to start it. Also, when I got started, the Tachometer and temperature gauge no longer worked. They had been working fine earlier. After setting the toe, I took the Jeep for a test drive and it drove great. But it still had a miss. I drove to Dayton to meet a friend for lunch and when I got home, I parked it on the porch behind Janice’s Jeep to drive it the next day. The next day, it would not start. I had to push it out of the way. I checked and rechecked the starter wiring. Eventually, I applied power to the starter motor with a jumper cable and still nothing. The starter motor had simply quit. I pushed it to the shop and installed a spare starter. It fired right up. But it still had a miss. There was also a strange noise coming from the power steering pump so I got out my stethoscope to listen to it. By the time I had the stethoscope in hand, the pump had quieted down so I decided to listen to some other things. I noticed I could hear the click of the injectors quite distinctly so I decided to listen to them all. When I reached number six, there was no click. Just the whine of fuel in the rail. A few days later, I decided to check further. I pulled the wire off and measured the resistance on the injector. It read about 16 ohms – the same as the spare. I connected a voltmeter to the harness and there seemed to be pulsing voltage there. It was hard to tell with my digital voltmeter. Next, I connected a spare injector to the harness and I could feel it clicking in my hand. So I decided to swap out the injector. I pulled the fuel rail and then when I went to swap the injector, I had misplaced it. I looked for several minutes knowing it had to be nearby; but eventually, I went to the bin and got another spare. I popped it in place and re secured the rail. I started the Jeep and had to shut it down immediately as gas was spraying everywhere. The O ring on the spare injector was bad. I pulled the O ring off the original injector then I put it all back together again. I started it up and this time there were no leaks. However, there was still a miss. I was stunned. I made up a test light using a side marker bulb and socket from the parts ZJ. I plugged it into the harness and sure enough the light blinked when the injector should be firing. I got out the stethoscope again and listened. No clicking. About that time, I saw where I had put down the first spare injector. I plugged it into the harness and I could again feel it clicking in my hand. So, once again, I pulled the fuel rail and swapped the injector and O ring. I let the rail pressurize and checked for leaks. Then I hit the starter and fired it up. It took a bit, but soon, the engine smoothed out to the nice purr that these inline sixes are famous for. The tachometer and water temp gauge still don’t work but at least it runs and drives well. I am sure that there is simply a ground wire loose that will fix both the gauges. I just have to find it. Marcus Ohms suggested I look behind the cluster so I will have to pull the dash to check it out. Update: I pulled the dash to look for a loose ground connector. I also printed of the wiring diagrams and started looking for things the non working items had in common. First I tested the ground connections and found they all had continuity. I also checked the power feeds to the dash and they all had voltage at the proper times. I noted that the Tach and temp gauge that did not work shared power with the fuel gauge that did work. So I ruled that out. I began working on each individual gauge. I started with the purple wires of the temp sensor. The temp sensor has a test feature that grounds the sensor while the key is turned to “START.” This feature was working fine. I then checked from the connector in the engine compartment to the cluster connector and found there was not continuity. I tried tracing the wire but it quickly disappeared into a harness on both ends. I considered running a new wire but I left that for a later possibility. Next, I tested the tach circuit. I found that the green and white wire again did not have continuity from the coil to the dash. It did have continuity however from the coil to the test plug under the hood. Just not to the dash connector. Finally, I moved on to the NSS connection. Since all three of these stopped working at the same time I was still looking for a common element. The black and white wire from the starter relay was easy to trace as it was partly out of its harness. I soon tracked it to a dead end plug. I quickly noticed that this pug also contained a green wire and a purple wire. I got very excited. I looked around the engine compartment and found the other end of the connector. I plugged them together and I could not wait to give it a try. Trouble was, the dash was still all apart. So, I at least wanted to see if it made any difference so I hit the key and the starter engaged! The NSS was working! I got even more excited. This being a dash with a mechanical speedometer, it takes a bit more work to put it back in than the later electronic speedometer. I finally found that if I connected the short cable extension to the cluster I could feed it through and screw it to the speed sensor under the dash and connect it together there. Once I got it all in place, I was very excited to see the Tach jump up when I started the engine. I had to wait a few minutes for it to warm up before I confirmed the temperature gauge was working as well. I drove the Jeep to my office this morning and I love the way this Jeep drives. I may have to keep it. You did a great job restoring that jeep. You had a pretty hard time on that one. How about the jeep’s performance?Have you tried modifying it too? A new engine maybe, or a exhausts or air intake systems might enhance it much better. No wonder why Google search result advert ace Themelis Cuiper referred this site – you are doing a fantastic job as he is pointing towards you? 😉 an address to this web-site was at Themelis Cuiper’s SocialGarden Biz cases > socialmedia advertising & B2B’s list of recommended web sites, you must be doing a fantastic job as he provides a book mark to you?